An experiment makes it users feel like floating ghosts by bombarding them with balls. Researchers at the University of Barcelona are using virtual reality to try to help subjects get over their fear of death. The VR project, created by Professor Mel Slater and his team, aims to induce an out-of-body experience in its user by tricking their brain into seeing a virtual body as their own. If you’ve ever come across the “rubber hand illusion”, it’s a similar setup. In that classic neurological parlour trick, a subject’s hand is hidden from view, beside a fake, rubber hand. The real hand is stroked at the same time as the rubber hand, and the brain gets confused between what it’s seeing and what it’s feeling – adopting the rubber hand as a real limb. In Slater’s study, 32 subjects were given an Oculus Rift headset and custom haptic bodysuit. The subject sees their virtual body, which mimics any real-life moments thanks to sensors in the suit. Then, virtual balls are dropped on the avatar, and simultaneous vibrations in the suit make it feel like the balls are hitting the subject’s actual body – a whole separate fear to overcome for frustrated jugglers. 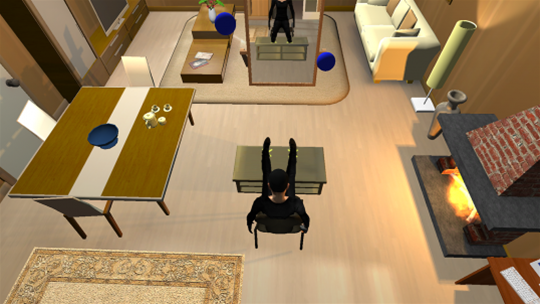 Once the subject’s brain has fallen for the trick, looking at the avatar as an actual flesh-and-blood body, the viewer’s perspective detaches itself and floats up towards the ceiling. Half of the group were made to continue feeling the balls tap against their arms and legs, and were unable to move the avatar’s limbs. The other half were able to move their avatar’s limbs, and to watch the balls hit the VR body – but not to feel them. Only those that continued to feel the vibrations felt they were still connected to the virtual body, and this brought about a sensation comparable to an out-of-body experience.